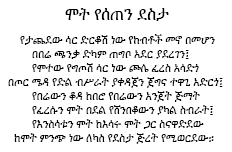 መጋቢት 30 ቀን 2011 ዓ.ም. 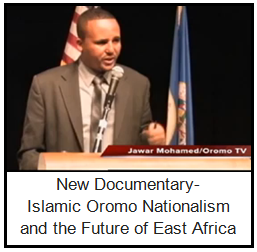 There is a huge propaganda blitz by the powers who brought to power the Abiy Ahmed Lemma Megersa group to power to cover up the deplorable and even dangerous situation Ethiopia, which given time, may plunge Ethiopia into a disastrous and catastrophic ethnic war to destabilize further the whole Horn of Africa region. Not much has changed from the point of the violation of human rights in the country. 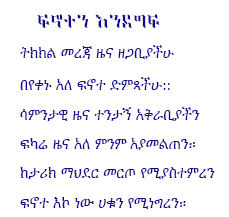 ብኩርናን በጭብጥ ምስር ያለወጠ ! 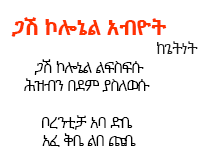 በጠላት ድግስ ገብቶ ያልቀላወጠ ! 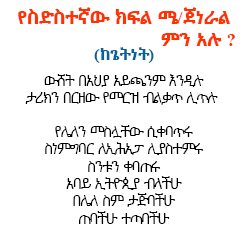 በቀለ ገርባ አብዷልና ዘመዶች ካሉት ወደ ጠበል ወይንም ወደ አማኑኤል ሆስፒታል ያስገቡት! 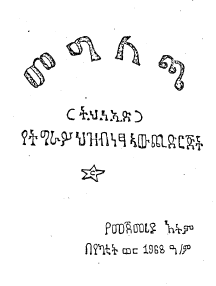 የካቲት 30 ቀን 2011 ዓ.ም. 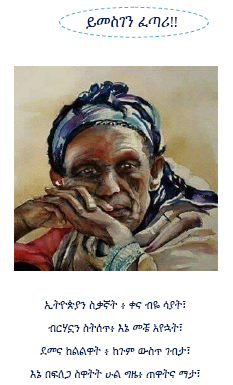 እንኳን ለኢመማ 70ኛ ዓመት ምስረታ እደረሳችሁ !! 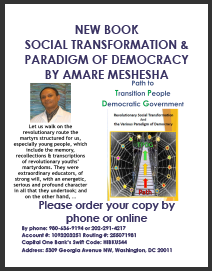 Social revolution for social transformation/salvation OR social reform for interethnic conflict/demise? 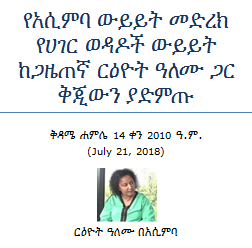 የኢትዮጵያን ሕዝብ ሰብዓዊ መብቶች መርገጥ ያብቃ! In a Country like Ethiopia where people's democracy has never been established historically, the more common pattern is one of under institutionalization in which political elites-groups are weak and often fragmented entitiesrelying on a single charismatic individual for leadership and guidance. These so called political elites, including the current dictator, are weak in the sense of not being able to penetrate society. 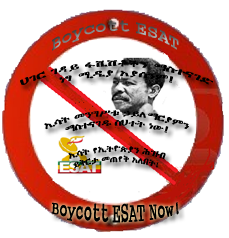 The propaganda blitz notwithstanding, the repressive system in Ethiopia is continuing. 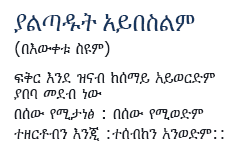 The "old-new" rulers have sponsored ethnic killings, no action against hate mongers instead arrested close to 3000 young peaceful in and around Addis Abeba. Their crime? Upholding the historic Ethiopian flag, condemning and calling for the arrest of the ethnic cleansers and demanding the release of all political prisoners. Developmental State or Political Marketplace? 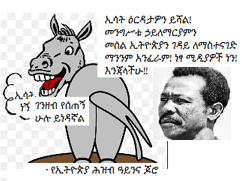 Abiy Ahmed and Isaias Afwerki are racing toward peace because they both face the same threat: hardliners in the Tigrayan People’s Liberation Front. Ethiopian officials say one person has died and dozens more are injured, after an explosion at a rally for the new PM Abiy Ahmed. 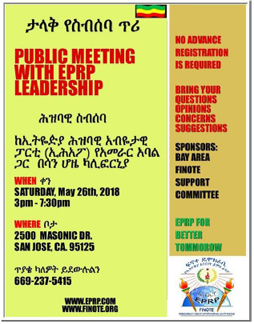 Despite the hue and cry on reforms and change in Ethiopia, the regime's hostility and negative practices against the EPRP continues. 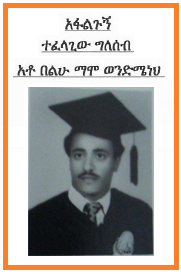 Not one EPRP political prisoner has been released despite the fact that dozens are imprisoned since 1991. 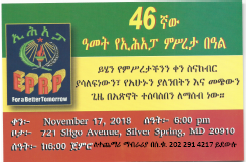 EPRP prisoners are not even recognized as such. The Ethiopian government must intervene to protect thousands of ethnic Amharas who are on the verge of displacement due to violent attacks on their homes by ethnically-motivated youth groups in Oromia Regional State, Amnesty International said. 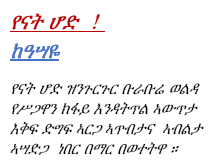 The repressive regime in Addis Abeba, convulsed by continuing mass protest, has been forced to admit it holds political prisoners and has released a thousand or so of them. 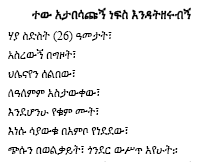 The regime holds more than 45,000 political prisoners in secret and official camps (gulags) and prisons all over Ethiopia. 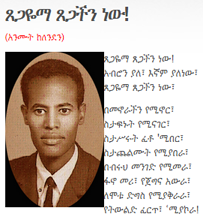 Human rights activist and a militant for democracy, Gezahegn Gebre Meskel, was assassinated in broad day light in Johannesburg. His killer has escaped and many Ethiopians there are certain that he was hired killer working for the embassy of the regime in Addis Abeba. 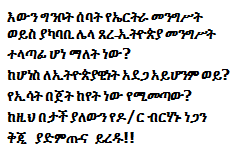 Gezahegn, a fearless militant, was the target of many death threats from the embassy, witnesses have revealed. Gezahegn, 48, is survived by his wife and two children. I wanted to write this article since last week but put it off due to lack of time. Netanyahu accepted a UN plan to end the deportation threat on 37,000 African refugees and I almost abandoned the idea of writing this article. Thanks to the extremist consistency of the prime minister (who rejected the UN plan ) here I go with my article. For many Ethiopians, this is the season of the ultimate Dickensian Paradox. For some, it is the best of times, for others, it is the worst of times. Some are high in hopes, others are still shrugging their shoulders. Ultra-optimists are waving their, ‘a new leader for the new day’ placard, cautious souls are beeping their alarm lights. It’s a pandemonium par excellence. Until the dust settled and we start talking about things with certitude, better dealing with what we know. H. RES. 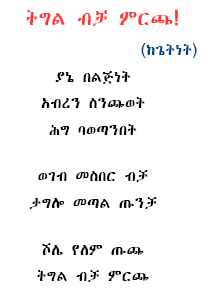 128 Supporting respect for human rights and encouraging inclusive governance in Ethiopia full text. It is not the first time that French presidents take to the stage to belittle and insult Africa. Former president Chirac admitted that Africa was crucial for the existence of France, though he did complain of our "noise and odors". His successor, Sarkozy, the man who is beleaguered by a court case alleging he took millions from Libya's Kaddafi for his election bid years ago, said of Africa: it has not passed the door of civilization. THE hue and cry about the release of a hundred or so political prisoners in Ethiopia has been proved a ruse as thousands of political prisoners including Moslem activists and the priests and monks of the Wadiba monastery, prisoners, including journalists ,trade union leaders and teachers jailed since 1991 as EPRP leaders and members, hundreds imprisoned in 1997, many more imprisoned for alleged membership of opposition organizations are still behind bars, in secret (ghost) prisons all over Ethiopia, in concentration camps like Zwai, Dedesa,Tolai,Awash Arba and Bir Sheleko,and in hell hole underground prisons in Tigrai itself. 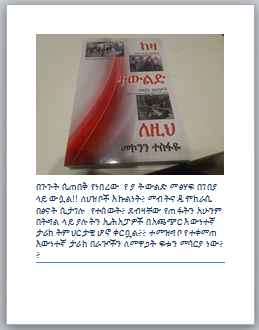 Ethiopia federal forces detain recently released Oromo leaders?? Government sources say the military will be in charge via a command post, which will be "reporting to the prime minister". 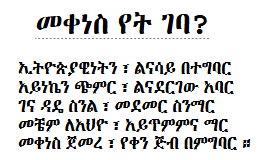 The repressive regime in Addis Abeba is adept at duping international opinion and hiding the real reasons of discontent of Ethiopians. And it has enjoyed the support of Western supporters and donors in its duplicity. 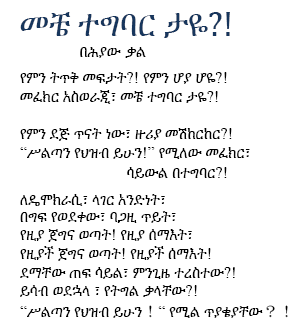 The nominal Prime Minister of Ethiopia has today declared that "all political prisoners in Ethiopia will be released". This is what the foreign media reported. However, the PM did not say that. Ethiopia's prime minister has announced the release of all political prisoners and the closure of a notorious detention centre which allegedly used torture to extract confessions. 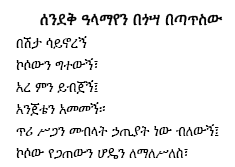 Judging from the deafening international silence on the issue one can be excused for concluding there are little or no violations of rights in Ethiopia. However, nothing could be farther from the truth. 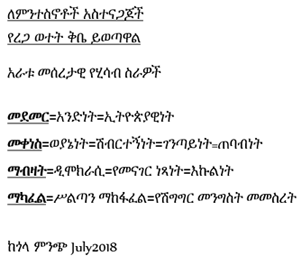 The violations of basic human rights in Ethiopia have worsened in the last year with hundreds of dissidents killed, thousands jailed, torture becoming rampant, freedom of the press trampled upon and a climate of fear and terror imposed. 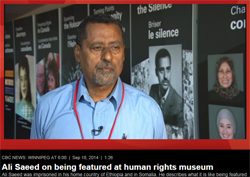 "…Money will not buy you freedom, freedom has to come from the bottom of your heart, and when you keep on struggling you will be free…" History of Red Terror is being told by Ali Saeed in the newly opened Canadian Museum for Human Rights. The NYU professor and best-selling author Economist William Easterly makes his case for a radical rethinking of approaches to global development. Watch this captivating video, showing life in Ethiopia as it is many times, a state of emergency. WWW. Assimba.org or WWW. Assimba.net web site does not make no representations, expressed or implied, as to the accuracy of the news, views, information and data contained on this site. WWW. Assimba.org or WWW. Assimba.net web site does not warrant or assume any legal liability or responsibility for any inaccurate or libelous information or for your use of the information contained in or linked from these web pages.